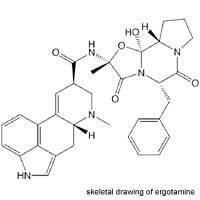 Home > Medication > Why Don't Doctors Prescribe Ergotamines Now? Ergotamines used to be used as a treatment for very severe migraines. People who get migraines suffer from intense head pain and other symptoms such as nausea and vomiting, sensitivity to light and sound, and have to retreat to a dark room to lie still when they are in the middle of an attack. Ergotamines work to relieve a migraine by constricting blood vessels in the skull that dilate during a migraine, contributing to the pain. Ergotamine is not a new drug. It was originally extracted from the ergot fungus as the First World War was ending in 1918. It was a rough extract then, but was marketed from 1921 as Gynergen and was used to induce labour and to stop bleeding after childbirth, as well as for severe migraines.As ergotamine was refined, it did get more specific but even a purer extract of ergotamine acts on several different neurotransmitter receptors in addition to serotonin. Doctors describe a drug like this as ‘non-specific’ in its action. Such drugs tend to cause a range of more severe side effects compared to drugs that act on only one receptor in a very specific way. Ergotamine works in the same way as triptans when given as a migraine treatment. It binds to 5HT receptors – the ones that match up with serotonin. These receptors are present on blood vessels in the brain, and when ergotamine binds, this causes the blood vessel to shrink. As the blood vessel constricts, it stops pressing on the tissues nearby, and fewer pain signals are generated, so the headache starts to ease. Ergotamine causes many different side effects. Taking it irritates the stomach and causes uterus cramps. It also leads to tingling sensations in the skin and angina. It can damage the endothelium, the inner lining of blood vessels and cause circulatory problems as it constricts blood vessels in the hands and feet. It also makes the person taking it drowsy and dizzy. Larger doses are very toxic and can stop the blood flowing through blood vessels, causing thrombosis and even gangrene. People with severe migraine are very disabled by their headaches and anything that relieves them is better than still having the pain. When there was nothing else, doctors felt that the risks were sometimes justified but they were never happy with ergotamine, or its derivatives, the ergotamines that have been refined and developed since the 1920s. Even dihydroergotamine, which is a much safer drug, still causes very unpleasant side effects, including constant diarrhoea. When triptans were discovered and approved for use in severe migraine in the 1990s, these drugs gave doctors and migraine patients a much safer alternative to ergotamines. Triptans don’t cause anywhere near the same level of side effects and they don’t cause rebound headaches as often. Taking ergotamines more than twice a week tended to cause a permanent headache, as the drug induced rather than relieved migraine. Today, someone with very severe migraine may be given a prophylactic medicine, but these tend to work in some people but not others. For people who are still struck down by several severe migraines each month there are now a whole family of triptans that can be prescribed and that can relieve a migraine within about an hour. Ergotamines are not prescribed routinely any more but they are reserved for some cases of migraine that fail to respond to triptans. One important fact that doctors and migraine patients need to remember is that triptans and ergotamines definitely must not be given together, or close enough together so they are both in the body. Ergotamines are also dangerous when combined with many other medicines and should never be taken by people with very high blood pressure, heart disease, liver disease or who have had a recent operation, as the healing process would be greatly impaired.